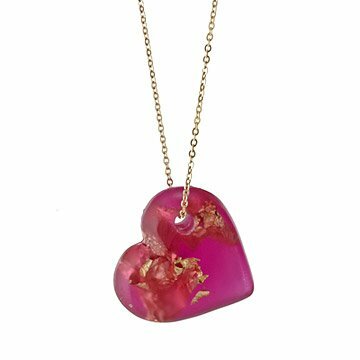 Embedded with gold leaf flakes, this resin heart pendant reinterprets the romantic statement piece. Crafted from plant-based resin and embedded with 24kt gold leaf flakes, this heart pendant reinterprets the romantic statement piece. The eye-catching flecks of gold glitter within the red resin as a playful symbol of the treasure that hearts can hold. A co-product of the lumber industry, the resin used is a renewable resource. Handmade by Tulianna and Alejandra Garces in Colombia. As with any handmade fine piece, it is not made to get wet and if it does, please wipe dry with soft cloth and let air dry completely. Please do not leave it exposed to extreme cold or hot situations. It is really very pretty. It isn't a dainty piece but it will be less likely to be banged up if you are purchasing for an active person. Beautiful, light-weight and comfortable to wear. I love it and wear it as often as I can. I was worried about the weight of the heart, but the charm is lightweight. My wife loves this heart necklace. It can be worn ever day. It is pretty and unique. Great last minute gift for a wonderful relative. Super fast shipping. And my aunt was overjoyed with the necklace. I would buy something again from this site. Very quick! The necklace is very beautiful, but arrived impossibly tangled. It took me 30 minutes to carefully undo all of the knots in the delicate chain and the clasp is so small it is next to impossible to do yourself without patience and a magnifying mirror. All things considered I would still recommend to a friend. Lovely and it was more than I hoped for ! My wife enjoyed the gift very much. The chain seems a little thin but overall a very nice product.